I'm on the road today with an interview by our very own Natalie Aquirre. For those who don't know, she's started blogging over at Literary Rambles and has been interviewing some very cool folks in the book biz. I'm delighted and flattered to be included in her lineup. Today I’m interviewing Janice Hardy. 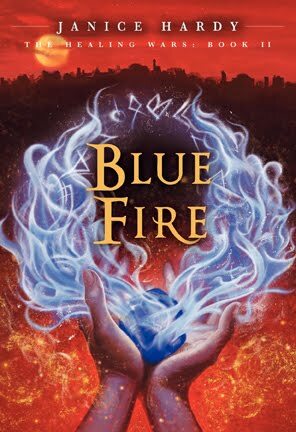 THE SHIFTER, the first book in The Healing Wars series came out in 2009 and BLUE FIRE, the second book, was released in October, 2010. The final book in the series, DARKFALL, will be released October 4, 2011. 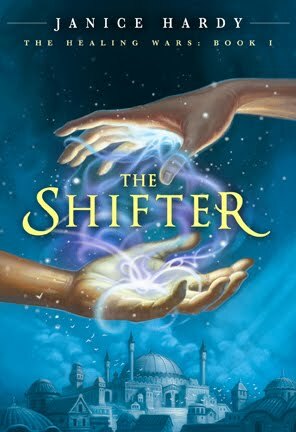 THE SHIFTER is one of those books that I totally had to read from the cover alone. Don't you just love it? I remember seeing it advertised on PW Children’s Bookshelf. I didn’t know anything about Janice or her agent, but I knew I had to read that book. And I was so glad I did. Hi Janice. Thanks so much for joining us. 1. Tell us a little about yourself and your books. I’m a former Florida gal who now lives in Georgia, though I couldn’t quite trade my oranges for peaches. I’m a movie buff, gamer geek, and lover of all things zombie. My teen fantasy trilogy THE HEALING WARS follows Nya, a war orphan who can heal by shifting pain from person to person, and when her sister disappears, this ability is the only weapon she has to stop her. In trying to save her sister, she’s pulled into a much bigger problem and ends up stuck in the middle of a war. I did she that she had joined LR, which is great. Heading over now to see your interview! Thanks for letting everyone know Janice about the interview. I'm so glad everyone is so excited about your interview. Angela: Cool! See ya there. Natalie: Thank you for having me over. Was fun and everything over there is so nice! It was so nice to have you, Janice. Thank you!